Learn to use the Tarot and Flower Essences to nurture yourself, clarify your journey, and find the medicine in any situation. 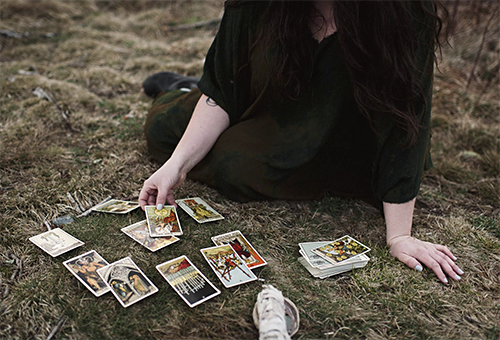 The Tarot is a powerful tool for reflection, and approaching the cards through a lens of self-care opens the door to an expanded personal practice of empowerment. We will begin with a discussion of using the Tarot as a mirror to reflect back that which we are unable or unwilling to see. This unlocks the power of the Tarot for personal empowerment: we are not trying to divine the future, but rather to untangle the threads of the present. We will then dive into flower essences, how they can be used in conjunction with Tarot to pinpoint areas of focus and create daily rituals to affirm your goals. We will learn tarot spreads, how to use the cards to select flower essences, and have the opportunity to practice reading for each other. No experience necessary. Please bring a 78 card tarot deck if you have one, a notebook, and a pen! Includes a copy of Sarah's Tarot and Flower Essences for Self-Care zine. Taught by Sarah Chappell from Asheville, NC.